სუსანა გიულამირიანი და პეტრა ჰულთმანის ღია კარის დღე გეოეარის რეზიდენციაში. სუსანა გიულამირიანის პრეზენტაცია “ჩართული ხელოვნების ფუნქცია და ფუნქციონალურობა“ შეეხებოდა ხელოვანთა ინტერესს „სოციალურის“ მიმართ, რომელიც გაზიარებულ იქნა როგორც სურვილი, შეცვლილიყო ტრადიციული დამოკიდებულება სახელოვნებო ნამუშევარს, ხელოვანსა და აუდიტორიას შორის. ზოგადი თეორიული მიმოხილვის შემდეგ, მან განიხილა სოციალურად ჩართული ხელოვნების მაგალითები საბჭოთა და პოსტ-საბჭოთა კონტექსტებში. სუსანამ, ასევე, წარადგინა ჩათული სახელოვნებო პროექტები, რომლებიც განვითარდა Art Commune საერთაშორისო სარეზიდენციო პროგრამის (ACSL) და მის In-LAB Platform [Theory and Practice] ფარგლებში. პეტრა ჰულთმანმა ისაუბრა ტექსტილის გამოყენებაზე ფემინისტურ მოძრაობებსა და თანამედროვე ხელოვნებაში. მან, ასევე, წარადგინა მისი სახელოვნებო პროექტი "CO:lab", რომელიც არის ჩართულ მიდგომაზე დამყარებული პლატფორმა, ღია სტუდია და სახელოსნო, რომელიც ამჟამად ყალიბდება “Art Commune” სარეზიდენციო პროგრამის ფარგლებში. "The sewing circle" არის სტრუქტურა სტრუქტურაში, ჩართული სახელოვნებო პროექტი, რომელიც ხორციელდება სომხეთის არასამთავრობო ორგანიზაციებთან ერთად და კონცენტრირებულია "საკერავი წრის" შექმნაზე, რომელიც იქნება მნიშვნელოვანი დიალოგების ფორუმი და წარადგენს ფემინისტურ განაცხადებს საზოგადოებასა და ხელოვნებაში. ასევე, თბილისში პეტრამ განახორციელა ხანგრძლივი ქარგვის პერფორმანსი. Susanna Gyulamiryan & Petra Hultman - open doors day at the GeoAIR residency. Susanna Gyulamiryan’s talk “Function and Functionality of Participatory Art” evolved on the artistic orientation towards the social, which has been shared as the set of desires to overturn the traditional relationship between the art object, the artist and the audience. General theoretical discussion was followed by the examples of participatory art, in Soviet times and nowadays, in post-Soviet contexts. Also, Susanna presented community-based, participatory art projects that were developed within “Art Commune” International Artist-in-Residence Program (ACSL) and its In-LAB Platform [Theory and Practice] that have been operating in Armenia and abroad. Petra Hultman gave a short talk and introduction on the use of textile craft within feminist movement and contemporary art, as well as presented her participatory art project "CO:lab" - a participatory run platform, open studio and continuous work-shop which is right now taking form within the “Art Commune” residency program. "The sewing circle" is a planned structure within the structure, a participatory art project in collaboration with NGO's in Armenia and focusing on the sewing circle as a forum for important conversations and feministic statement in society, as well as art. 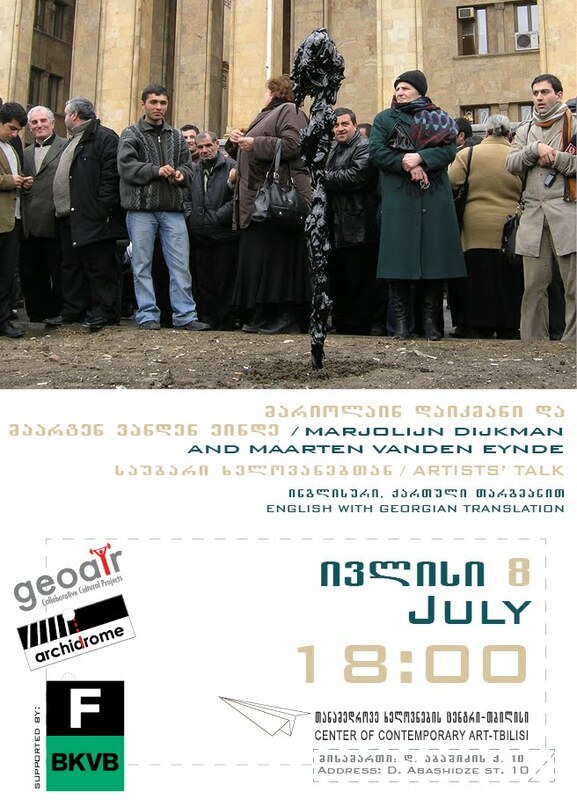 In addition to this talk, Petra also made a long duration embroidery performance in Tbilisi. სუსანა გიულამირიანი დაიბადა ერევანში, სომხეთი. ის არის ხელოვნების კრიტიკოსი, კურატორი და მუშაობს როგორც სომხეთში, ასევე, საერთაშორისო დონეზე. ამ ეტაპზე, მისი ინტერესის სფერო მოიცავს „სხვის“ ეპისტემოლოგიურ, ფილოსოფიურ აღქმას, ბიოპოლოტიკის ანალიზს, გენდერისა და ფემინისზმის საკითხებს თანამედროვე სახელოვნებო პრაქტიკაში და ასევე, „აღმოსავლეთ-დასავლეთის“ საკითხებს, რომლებიც ეხება „წარმოსახვითი გეოგრაფიების“ კვლევასა და რუკების შექმნას. 2007 წელს, თანამშრომლობის შედეგად, მან დაარსა „ხელოვნებისა და კულტურის შესწავლის ლაბორატორია“ (ACSL), სადაც დღემდე მოღვაწეობს პრეზიდენტის რანგში. 2008 წელს მისი ინიციატივით დაარსდა “Art Commune”, საერთაშორისო სახელოვნებო რეზიდენციის პროგრამა სომხეთში. 2006 წლიდან ის არის AICA (ხელოვნების კრიტიკოსთა საერთაშორისო ასოციაცია)-სომხეთის საბჭოს წევრი. 10 წელზე მეტია რას სუსანა გიულამირიანი ასწავლის კულტურის მეცნიერების კურსებს სომხეთის ღია უნივერსიტეტის, სახვითი ხელოვნების დეპარტამენტში (განათლების საერთაშორისო აკადემია). ის იყო CinemArt ჟურნალის თანარედაქტორი, სადაც უძღვებოდა ყოველთვიურ განყოფილებებს - „სახელოვნებო სიტუაცია“ და „ხელოვნების სახელი“ და ამავდროულად, მისი თანამშრომლობითი კრიტიკული სტატიები სომხეთის სხვა პერიოდულ გამოცემებშიც იბეჭდებოდა. ის არის მოწვეული, ასოცირებული წარმდგენი ისეთ კონკურსებზე, როგორებიცაა - საერთაშორისო ორწლიანი ჯილდო გამოჩენილი მიღწევებისათვის ხელოვნებასა და პოლიტიკაში (ვერა ლისტის ხელოვნებისა და პოლიტიკის ცენტრი, New School, New-York); ასევე, ყოველწლიური ჯილდო სახელოვნებო კრიტიკის საუკეთესო სტატიისათვის (სომხეთის რესპუბლიკის კულტურის სამინისტრო). Susanna Gyulamiryan born in Yerevan, Armenia, is an art critic and curator, who has been working in Armenia and internationally. Her current fields of interest include the epistemological, philosophical issue of the other, examination of biopolitics, gender and feminist issues in contemporary art practices, and the issue of “East-West” with mapping and research on “imaginative geographies”. In 2007, she collaboratively founded the “Art and Cultural Studies Laboratory” (ACSL), where she was the appointed president until nowadays. In 2008, she was an initiator of founding the “Art Commune” International Artist-in-Residence program in Armenia. Since 2006, she is a board member of AICA – Armenia (International Association of Art Critics). More than ten years, Susanna Gyulamiryan has held courses in Cultural Studies at the Armenian Open University, Department of Fine Arts (International Academy of Education). She was a co-editor of the CinemArt magazine where she were leading the monthly columns “Art Situation” and “the name of Art” with simultaneous collaboration critical articles making in other periodics in Armenia. She is an invited, associated nominator of the International Biennial Prize Council for outstanding achievements in Art and Politics by the Vera List Center for Art and Politics at the New School, New-York and nominator of the Price Council for the Annual award of the best article of Art Criticism launched by Ministry of Culture of the Republic of Armenia. პეტრა ჰულთმანი არის შვედეთში მოღვაწე ხელოვანი და სტოკჰოლმის ხელოვნების სამეფო ინსტიტუტის ხუთწლიანი სახვითი ხელოვნების პროგრამის სტუდენტი. ის იყენებს თავის გამოცდილებას, როგორც პროექტების კოორდინატორი, როდესაც ქმნის სოციალურადჩართულ პროექტებს, სადაც თანამშრომლობის, ჩართულობის, დიალოგის, ვორკშოპების და პროვოკაციების საშუალებით ეკონტაქტება საზოგადოებას. ახალი და ტრადიციული ტექნიკების ერთდროული გამოყენებით, პეტრა იკვლევს ჩართულობის სხვადასხვა ფორმებს, შემოქმედებით პროცედურებს და ასევე, კოლექტიური და თანამშრომლობითი პრაქტიკების სტრუქტურებს. მისი ნამუშევრები ხშირად პროცესზე ორიენტირებულია და როგორც სხვადასხვა მედიის ხელოვანი, ის იყენებს ანიმაციას, ინსტალაციას, ვიდეოს, პერფორმანსს, ფოტოგრაფიას, ქანდაკებას და წერილობით ნამუშევრებს. მისი ინტერესის სფეროებია: ზოგადად, სტრუქტურები და კონკრეტულად ისინი, რომლებიც ეხება გენდერის საკითხებს, მეხსიერების კონსტრუირება და მისი კავშირი დოკუმენტაციასთან, ფსიქოლოგია, ადამიანთა ურთიერთობა და ჯგუფური დინამიკა. Petra Hultman is a Sweden based artist and student at Royal Institute of Art in Stockholm, 5-year university program in fine art (Ba-Ma). She uses her previous background as a project co-ordinator when working with a socially engaged practice where she through collaboration, involvement, dialogue, workshops and provocation interacts with society. By using both new and traditional techniques Petra is exploring different forms of participation and creative procedures as well as structures for collective and collaborative practices. Her work is usually process oriented and as a mixed media artist she has a broad range of practice including animation, installation, video, performance, photography, sculpture and text based works. Fields of interest are: structures in general and in particular those concerning gender, construction of memories and its' relation to documentation, psychology, human relations and group-dynamics.